Pamphylia, was a small region on the southern coast of Anatolia, extending about 120 km (75 miles) between Lycia and Cilicia, and north from the Mediterranean only about 50 km (30 miles) to mountainous Pisidia. The Pamphylians were a mixture of aboriginal inhabitants, immigrant Cilicians and Greeks who migrated there from Arcadia and Peloponnese in the 12th century BC. In 190 BC they were annexed by the Romans to the dominions of Eumenes of Pergamum, but later they joined with the Pisidians and Cilicians in piracy, and Side became the chief center and slave mart of these freebooters. 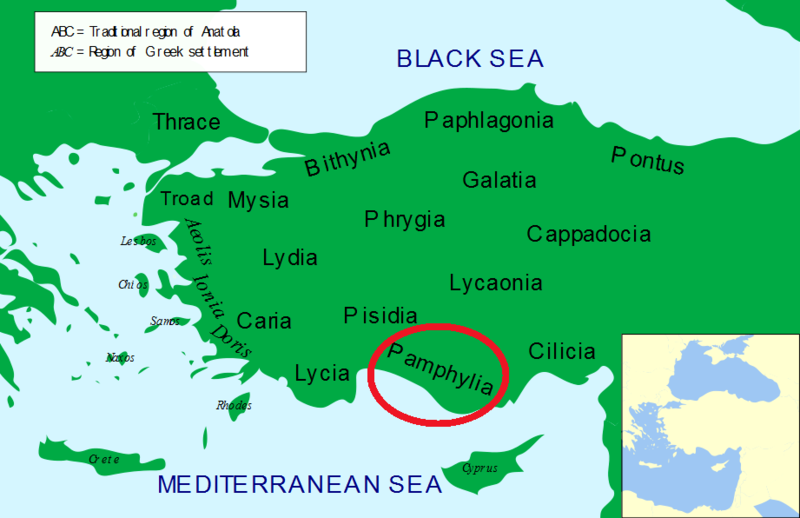 Pamphylia was for a short time included in the dominions of Amyntas, king of Galatia, but after his death was absorbed into a Roman province. The Pamphylians became largely Hellenized in Roman times, and have left magnificent memorials of their civilization at Perga, Aspendos, and Side.